Just read issue #65. I don't know now. Maybe I was expecting something more - but with 'Fear The Hunters' approaching its climax, what is there to 'fear'? Nothing, it seems. I liked the last page. Rick looks feral nowadays, a yin to the yang of Sgt Fords Military style neatness. The last 4 or 5 pages nearly made up for the middle section, which was saggy and made me wonder what the fuss was about with 'The Hunters' all along. There were some other nice touches - Eugene being useful, Andrea being altogether useful, caring and a crack-shot, and Charlie Adlard drawing the rack and ruin of Suburbia in such a way that the misery seeps out of the page at you. The death of nearly everything - Charlie Adlard can summon up that vista for you in a few panels of black and white art. Verdict. I still enjoyed this issue by the way, but the Hunters seem such an anti-climax. Still, there is enough here to keep the many fans of the book satisfied, but the whole arc seems destined to be less than what I expected....7.75 out of 10. 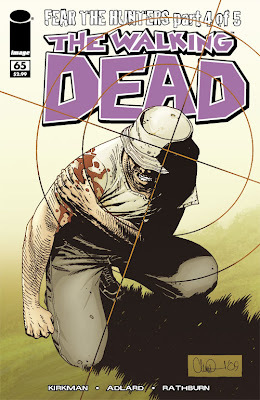 The Walking Dead #65 is out now from Image.